Caption: Archaeologists Christine Newman and Ray McGee excavate a group of canoes. In the Spring and early Summer of 2000, drought conditions across north-central Florida lowered water levels in many lakes, ponds, and streams, including Newnan's Lake, just east of Gainesville in Alachua County. Local residents exploring the dried up lake bed discovered the remains of nineteenth and early twentieth century skiffs, and further investigation by archaeologists revealed that these relatively modern boats were alongside much older, prehistoric canoes. While low water levels have often led to the discovery of prehistoric and historic period canoes, and in some cases groups of canoes, the Newnan's Lake find appeared unique in having such a large number of canoes. Up until this time, about 250 to 300 canoes in total have been reported from Florida. Archaeologists Christine Newman and Ray McGee excavate a cluster of three canoes. 86 canoes were recorded along two-mile stretch of the exposed lake bed—the largest group of prehistoric canoes found to date in North America. 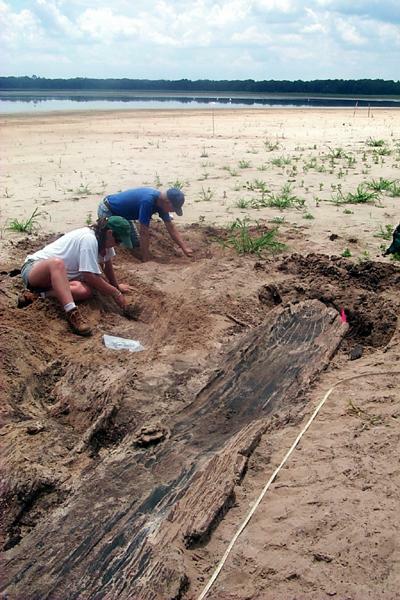 Walking along the dried lake bottom, the crew could identify the canoes by recognizing traces of the wood from the sides and ends of the boat protruding from the bottom mud. Careful excavation of 53 of the canoes revealed some interesting similarities and differences. Prehistoric Canoes in Florida (new window), as well as the type of wood used in making them. Wood samples were taken from the 53 canoes in the study group, and have been submitted for radiocarbon dating and wood species analysis. The oldest canoes in Florida are from DeLeon Springs in Volusia County, and date to 6,000 years ago, while some others are only a few hundred years old. The age range of the Newnan's Lake Canoes date from 5000 to 500 years old, with nearly 70% of them dating between 3000 and 5000 years old. As is the pattern for other canoes reported in Florida, almost all the Newnan's Lake canoes were made from pine.